Lucy Phillips graduated from the University of York, and went on to complete a Masters in performance at the University of Limerick. In 2009 she moved to Sheffield to develop her work as a freelance performer and teacher. She performs regularly in a number of chamber ensembles, including the newly-formed quartet Sarentino Strings. Since October 2016 Lucy has been teaching violin at the Department of Music of the University of Sheffield. Current projects include a collaboration with organist Mark Swinton. The duo has already given recitals in Chester, Bath, Derby and Warwick and recorded a CD ‘The Lark in the Chapel’ in 2015. In 2017 they premiered Scherzo Diabolique, written for them by composer David Briggs. Lucy recently finished a cycle of the complete Beethoven Violin Sonatas in Sheffield. 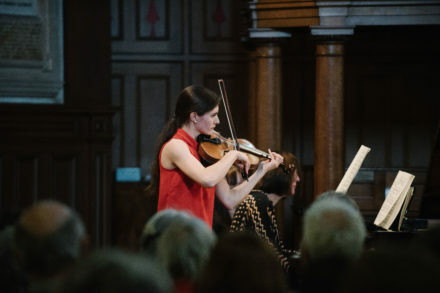 She also organised a charity concert in 2014 to raise money for Marie Curie Cancer Care which featured a performance of the Mendelssohn Concerto for Violin and Piano with Ensemble 360's pianist, Tim Horton.